Polyethylene water cisterns are ideal for instances when drinking water must be hauled in or if a well does not meet consumption needs. 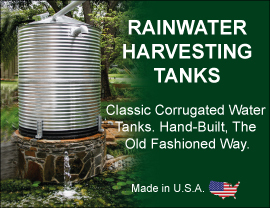 NORWESCO tanks are manufactured using resins that meet FDA specifications to ensure safe storage of potable water. Where applicable, NORWESCO’s have been certified under ANSI/NSF™ Standard 61. The 325 and 550 gallon spheres may remain in the ground when empty. These tanks include a molded-in elevated pump stand on the bottom of the tank. The ribbed tanks (600 gallon and larger) need to be kept 1⁄4 full at all times. The 2000 and 2500 are the largest capacity below ground cisterns made today. Typically used to store water–both potable and non-potable–it can also be used as a large capacity septic tank. The end ribs will accept fittings up to 4" in size. Integral columns in the tank give it excellent structural strength.